McDonald’s McCafé Instant Win (McCafeInstantWin.com): Look for an on-pack code on a specially-marked bag of McDonald’s McCafé coffee and you could instantly win one of thousands of prizes including a new SUV. 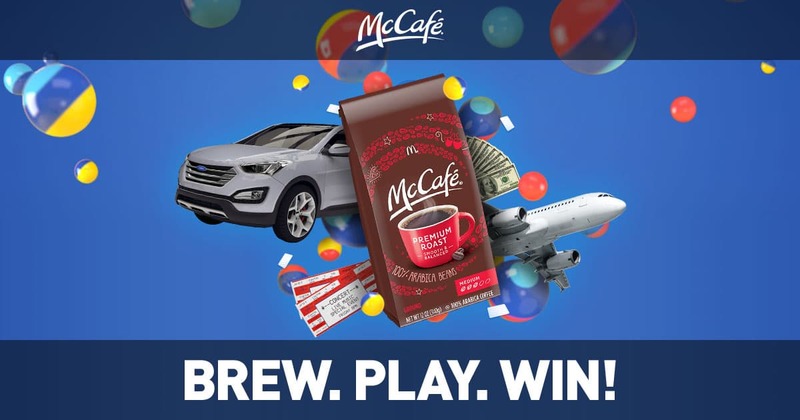 Brew, play at McCafeInstantWin.com, and win today! The McDonald’s McCafé Instant Win is open to legal residents of the 50 United States and D.C., who are 18 years of age or older at time of entry,. The Sweepstakes begins at 12:00 am ET on April 1, 2019 and ends at 11:59 pm ET on September 1, 2019. Limit of up to five (5) Instant Win Game plays during the Promotion Period per email address/person, regardless of method or combination of methods of obtaining Codes. The grand prize consists of a 2019 Ford Escape and $7,500.00 check. Visit www.mccafeinstantwin.com to enter and see Official Rules for details.